Within the Azure App Service is something called WebJobs that enables developers to run a script or program in the background within the same context as a web app, API app, or mobile app. Wejobs are included in app service with no extra cost. Webjobs are often used to run regular jobs and batch work as background services. Webjobs exist to make it easier to develop, run background tasks, and scale your web applications. – A comparison between WebJobs and Functions: Choose between Flow, Logic Apps, Functions, and WebJobs. I recently needed to setup monitoring for Azure webjobs status. In this environment there was a mix of continuous webjobs along with some triggered webjobs. Monitoring WebJobs is different compared to monitoring other Azure App Services such as web apps. Web apps can easily be monitored for up/down status and performance for things like in/out traffic, usage, and errors. Background services like WebJobs does not have a defined start or end to the work they do. WebJobs either run continuously or for short amounts of time to perform a task. In this case performance was not a concern but the status of the WebJobs was needed. You can see the status of the WebJobs in the Azure portal as shown in the following screenshot. The problem here is this is not on a monitoring dashboard, you have to navigate here to see it, you need to click the refresh button for an update, and there is no alert setup when the status is in a non-desired state. 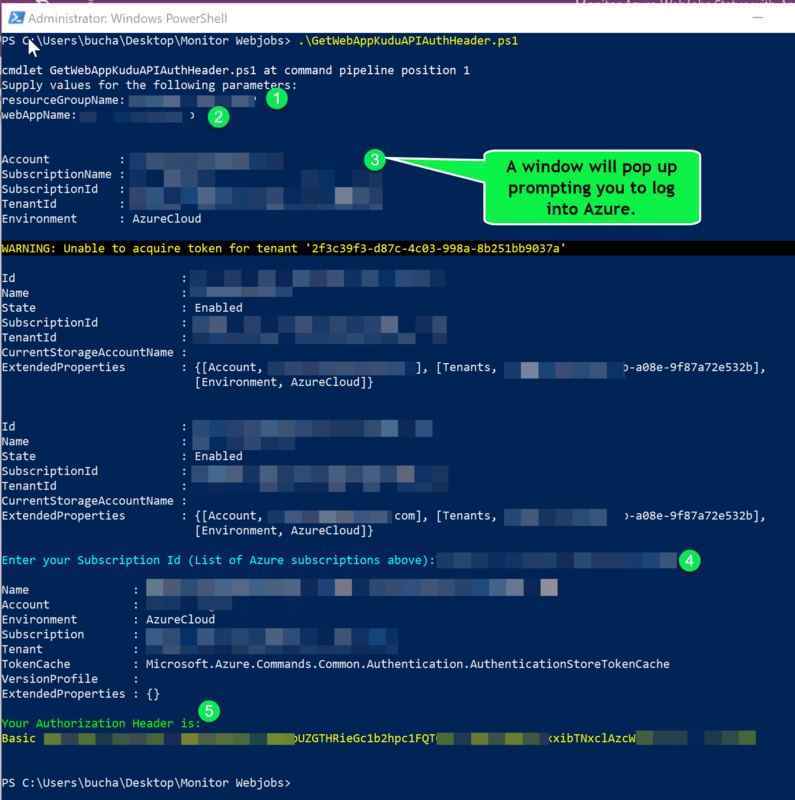 The logs site is nice but the issue with it is that you have to be on the site to see the status of the WebJobs along with the previously mentioned issues viewing the status in the Azure portal. A good solution for monitoring the WebJobs would be a way to check the heartbeat of the WebJobs, the status, and alert you if one of the WebJobs is in a non-desired state. The good news is that this can be accomplished utilizing Application Insights. This is not new but does take some effort to setup. I am going to detail how to set this up. Here is a summary of what needs to be done. Need an authorization header from the WebJobs REST API. Need to create a webtest manually or using Visual Studio enterprise. Create a multi-step availability test in the Application Insights instance utilizing the webtest file. Create an alert on the availability test to notify when a WebJob is in a non-desired state. Add the results of the WebJobs availability test to a dashboard in Azure. From within the web app that contains the WebJobs create a new Application Insights instance as shown in the following screenshot. – #1 Get the Publishing Profile Credentials from the WebJobs Web App. – #2 Use the Publishing Profile Credentials to get the Kudu REST API Authorization header and encode in Base64. Run .\GetWebAppKuduAPIAuthHeader.ps1. The following screenshot shows the script and authorization output. Make sure you copy the authorization header as you will need it later on. Step 3 – Need to create a webtest manually or using Visual Studio enterprise. In the WebJobs URL’s change “webappname” and “WEBJOB1” to the names of yours. Next open Visual Studio 2017 Enterprise. In Visual Studio create a new web performance test like shown in the following screenshot. Next right click on the new WebTest and add a new “Request” add an “Authorization Header” add a “Validation Rule”. For the “Request”, “Authorization Header”, and “Validation Rule” add the property settings for each as shown in the following screenshots. Step 4 and 5 – Create a multi-step availability test in the Application Insights instance utilizing the webtest file and an alert on the availability test to notify when a WebJob is in a non-desired state. Within Application Insights click on Availability and then click on the Add tests button. #1 Add a name, #2 change the test type to multi-step web test, #3 upload the webtest file that we created in Visual Studio, change the test frequency if you want to, change the test locations if you want to, #4 modify the alerts with the proper information. #4 To setup the alert complete the following settings like in the following screenshot. Note that you also could have the alert connect to a webhook to fire off some sort of automated remediation. You will need to setup an availability test in your Application Insights instance for each one of your webjobs. When it’s all said and done your webjobs will each have a multi-step availability test that will ping the webjob and look for a specific job status. The results are shown in the following screenshot. Thanks for reading this blog post! Stay tuned for more. Where to host Docker Containers on Azure (AKS, ASE, or ASF)? Janaka Rangama | MVP SysCTR, Azure et..